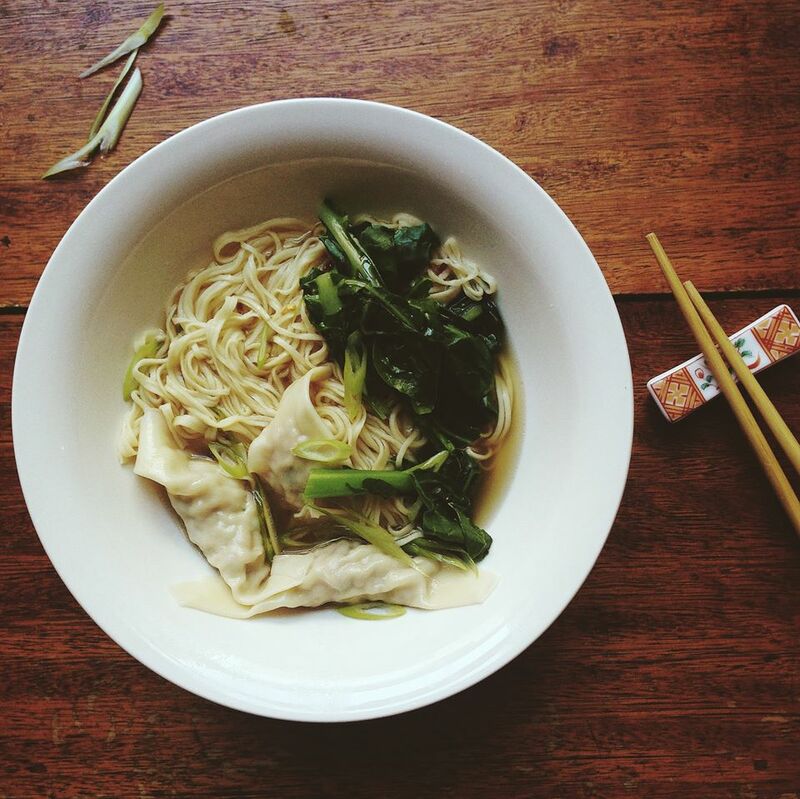 I absolutely love wonton noodle soup, even if it is peak Summer! The delicate broth seasoned with sesame oil and soy, punchy flavour-filled dumplings and fresh noodles! It's not often I make it at home, we are so spoilt for choice here in Melbourne and a quality bowl of the good stuff is never far from home, but making it al from scratch is really rewarding, and perhaps more convenient as it is Chinese New Year and to get a table at your favourite Chinese restaurant is a little harder than usual. I didn't make the wonton wrappers, although you could do this if you were extra keen! The broth too, can be pre-bought although I make a simple chicken broth with chicken bones and some basic aromatics like onion, celery and carrot, just covered with water and simmered. I used Chinese broccoli but you could replace it with any other green vegetable, or leave it out entirely. A little chilli oil on the side is a nice addition if you prefer your soup spicy, too. 1. To make the noodles, place the flour in a large bowl and add the salt and baking soda. Make a well in the centre and add the eggs. Slowly incorporate the flour into the eggs until the flour is combined and the mixture is too stiff to work in the bowl. At this point you may need to add a few tablespoons of water to help the dough form. Turn the dough out onto a floured board and knead for 5-10 minutes, or until soft and elastic. This can also be done in a mixer fitted with a dough hook, like I do. Cover the dough with plastic wrap and set aside for 30 minutes to rest. 2. While the dough for the noodles is resting, you can begin to make the wontons. Place all the ingredients, except for the wrappers, in a bowl and mix thoroughly until really well combined. You may need to get in there with your hands to make sure there are no big pieces of mince. everything should be a stick homogenous meat-ball consistency mixture. Now working with one wonton at a time, place a heaped teaspoon of the mixture in the centre, wet the edges with water and fold over the wonton so the corners meet and form a triangular parcel. Press tightly to seal well. Repeat with remaining mixture. Wontons can be placed on a tray lined with baking paper as you finish making the noodles. 3. Now, back to the noodles! Once the dough has been rested, working with one quarter of the dough at a time, pass the dough through a pasta machine, starting from the widest setting, until the dough is 2mm thick and has reached the finest setting on your machine. Now you can either cut the sheet of dough to make thin noodles using a sharp knife, or if you have a spaghetti attachment, pass the sheet through to make thin noodles. If sticking, flour the sheets well. Flour the noodles and set aside in bunches on a floured board. Repeat with remaining three quarters of the dough. 4. Here is where a deft hand and quick movements help this dish come together. In a pot, bring the stock up to a simmer and season with the sesame oil and soy. In another pot, you want some water on the boil ready for the noodles, and if you have another to spare, one for your wontons. Cook the noodles in batches only for 2-3 minutes or until al dente. Meanwhile, cook the wontons in boiling water for around the same time, 3-4 minutes or until just cooked through. Have your bowls ready and divide the noodles and wontons amongst the bowls. Add some Chinese broccoli to each and pour over the hot broth. Sprinkle over some spring onion and add a few drops of sesame oil. Serve immediately with chilli oil on the side.